You are here: Home / God / How Many God and Goddess are There in Hindu Religion? However, that’s not the only trait of the Hindu religion. In fact, there are many things which make Hinduism unique and one of the most widely accepted religions in the world. Typically, Hindu religion is known for its rich and varied festivals, elaborate rituals, scores of religious texts, religious practices, its concept of life, principles, ideology, and of course for its many Gods. Hindus are seen worshipping different Gods. Whether it is in the form of Lord Ganesh, Lord Shiva, Lord Vishnu, Lord Krishna, Lord Rama, Lord Hanuman, Goddess Durga, Goddess Lakshmi, Goddess Parvati, Goddess Saraswati, Goddess Kali, and scores of other Gods, and Goddesses. In fact, this question has not only perturbed the Westerners but also many Hindus themselves are not aware of how many God and Goddesses there are in Hinduism. It’s very astonishing, but the fact remains that there is much confusion about the number of Gods and Goddesses in the Hindu religion. That said, many Hindus believe that there are 33 Crore Gods and Goddesses in Hinduism. However, none know the names of these 33 Crore Gods or 330 Million Gods in the Hindu religion. How Many God and Goddess? In this post, we take up the burning question of how many God and Goddesses are there in Hindu religion? To start with, it is necessary to point out that the idea of “33 Crore Gods” is a highly misinterpreted fact. Yes, the belief that there are 33 Core Gods is actually a myth. Although the Atharva Veda, Yajur Veda, and Satapatha-Brahmana mention the term ‘Trayastrimsati Koti’, it is misunderstood as 33 Crores. In fact, the term ‘Koti’ in Sanskrit has two meaning. Likewise, the Buddhists texts mention, “Sapta Koti Buddha” which actually meant 7 Supreme Buddha and not 7 Crore Buddha. Now, the question arises, who are these 33 Gods in Hinduism and what are their names? The Vedas have aptly described the 33 Gods in Hinduism. According to Vedas, there are 33 Gods. And out of the two left, one is Prajapati, the Master of Gods, and the other is Indra, the Supreme Ruler. This fact about 33 Gods in Hinduism is well documented in Chapter 3, Part 9 of ‘Brihadaranyaka Upanishad’ where Sage Yajnavalkya is questioned by Sage Sakalya. Sage Yajnavalkya goes on to mention that the eight Vasus are the fire, the earth, the air, the sky, the sun, heaven, the moon and the stars. The ten organs in the human body, with the mind as the eleventh, represent the eleven Rudras. He also points out that there are twelve months in the year. These are the Adityas. As Vedas are the most ancient texts of the Hindus, it would be right to know what they have to say about the number of Gods in Hinduism. In fact, the Rig Veda throws light on the number of Gods in Hinduism. According to the Rig Veda, there are 3 Gods – Agni on Earth, Vayu in the Air, and Surya in the Sky. However, the Rig Veda increases this number to thirty-three (33), of which 11 are said to be on Earth, 11 in mid-air, and 11 in heaven. So, it goes beyond doubt that there are 33 Gods in the Hindu Religion. The Vedas themselves are the testimony of this fact. Moreover, it is mentioned many times in Vedas. 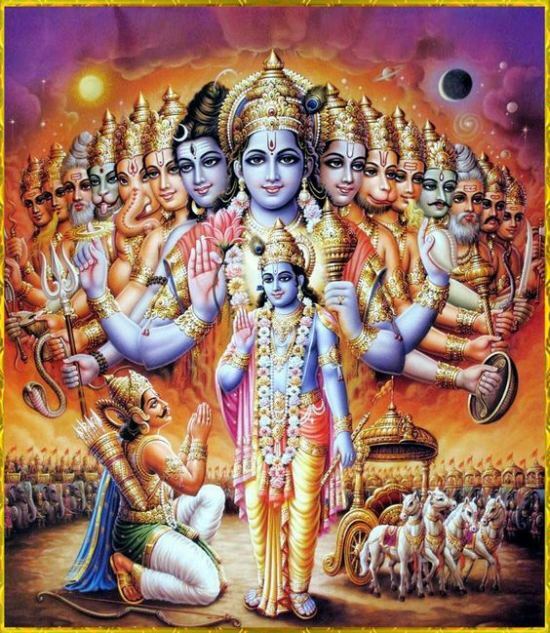 33 Gods are simply 12 Adityas, 11 Rudras, 8 Vasus, Prajapati and Indra. Now, we explore these 33 Gods in the Hindu Religion which manifest in the form of 8 Vasus, 11 Rudras, 12 Adityas, Prajapati, and Indra. The Hindus recognize that the eight (8) Vasus are the attendant deities of Indra. They are referred to as the eight elemental Gods, also known as Astha Vasus (Eight Vasus), that go on to signify the different aspects of nature and represent cosmic natural phenomenon. The eight Vasus are the eight demi-gods and have been named as Anala, Anila, Soma, Ahas, Dhara, Dhruva, Pratyoosha and Prabhasa. Ramayan has a mention to these eight Vasus as the children of Kashyap and Aditi. Mahabharata also describes the Astha Vasus as the sons of Manu or Brahma Prajapati. These eight Vasus go on to represent the very elements of Mother Nature. These are eight among the thirty-three Hindu Gods. There is an interesting story that describes the curse of the 8 Vasus. Once it so happened that the wife of Prabhasa Vasu persuaded her husband to get her the cow which actually belonged to Rishi Vashishta. Prabhasa initially refused to ask for anything from a Brahmin. However, he was led by his wife and later agreed to steal the cow for her. Prabhasa took the help of his seven brothers and together with the eight Vasus purloined away Vashishta cow for Prabhasa wife. Rishi Vashishta used his ascetic powers and came to know that the cow has been stolen away by the eight Vasus. He cursed that the eight Vasus would be born on Earth as mortals and suffers the pain as all mortals do. The eight Vasus begged for pardon and pleaded Rishi Vashishta to take back the curse. However, Rishi Vashishta told them that his words would come true and the curse could not be taken back. However, he told that the best he can do for them is to modify the curse. Rishi Vashishta granted some relief to the seven Vasus and told them that their lifetime on earth would be short and after that they can ascend to the paradise. However, Prabhasa who initiated the steal on behalf of his wife would suffer the pain on account of all the seven Vasus. He will never know the pleasure of a woman. Prabhasa would live without a wife and sons. He would spend his entire life struggling to serve his household. In the end, he will die at the hands of a woman. The eight Vasus then approached Goddess Ganga and begged her to help them keep their stay on earth for a short duration of time. Ganga promised to help them. The Ganga told them that she would give them birth through her womb and will drown them in the waters of Ganga making them free from the curse the moment they are born. Ganga was married to King Shantanu of Hastinapur. It was agreed that King Shantanu would not stop her or question her from doing anything. The moment he questioned her, Ganga would leave Shantanu forever. Ganga drowned the seven Vasus immediately on their birth. However, when she was about to drown Prabhasa, she was stopped by Shantanu. It was Prabhasa who grew up as Devaratta and was known as Bheeshma. He took the terrible oath that he would not marry his entire lifetime. It turned out to be the cause of all his sufferings and also led to the Great Kurukshetra War between the Kauravas and Pandavas. Who are the 11 Rudras? Rudras are described as the forms of Lord Shiva. There are eleven Rudras in all that is considered as a part of thirty-three Gods in the Hindu pantheon. The Vamana Purana describes the Rudras as the sons of the sage Kashyap and his wife, Aditi. According to the Vishnu Purana, all the eleven Rudras were born from the anger of the creator-god Brahma. The furious Rudra took the form of Ardhanari. Half his body was male, and other half was female. He divided himself into two forming the male and female parts. The male form split itself into eleven thus forming the eleven Rudras. Lord Brahma gave the Rudras the eleven positions of the heart as well as the five organs of action, the five sensory organs, and the mind. Kapali is considered the foremost Rudra. The Rudras aid Lord Vishnu in his fight against the demons. They wear lion-skins, have serpents around their neck and are studded with matted-hair. They have yellow throats, they hold trident and skulls. Rudra also adorn the crescent moon on their foreheads. In one instance, the Rudras headed by Kapali slay the elephant demon named Gajasura. As per the Vedic mythology, Rudras have been described to be the loyal companions of Rudra who was later identified with Lord Shiva. They have been regarded as friends, messengers, and aspects of Rudra. In fact, the Rudras are fearful in nature. They have been considered as attendants of Shiva in later mythology. According to the Rig Veda, the Rudras are considered to be the gods of the middle world, situated between earth and heaven. The Rudras are deemed to be the wind-gods and represent the life-breath. According to the Brihadaranyaka Upanishad, the eleven Rudras represent the ten vital energies in the body, and the eleventh one is considered as the Atman (the soul). They have immense power and are “like lighting-illuminated clouds.” The Bhagavata Purana states that the worship of Rudras is important for gaining virile power. Who are the 12 Adityas? In Hinduism, Adityas refer to the Sun God, Surya. He is considered to be the offspring of the goddess Aditi and her husband, the sage Kashyap. The Bhagavata Purana goes on to list a total of twelve Adityas as Sun-gods. So, in each month of the year, it is a different Aditya that is said to shine as Sun God. In fact, the twelve Adityas are the different forms of the Sun God – Surya. As per the Vaishnava tradition of Hinduism, each of the Adityas is a different expression of the Supreme God Vishnu who manifests himself in the form of Sun-God. In the form of Indra, the Sun God (Surya) destroys the enemies of the gods. As Dhata, the Sun God goes on to create the living beings. In the form of Parjanya, the Sun God showers down rain. As Tvashtha, he lives in the trees and herbs. As Pushya, he grows the food grains. In the form of Aryama, he is in the wind. As Bhaga, he lives in the body of all living beings. As Vivasvan, he is in fire and helps to cook food. Lord Vishnu, he is considered to be the destroyer of enemies of the Gods. As Amshuman, he is again in the winds. As Varuna, he is in the waters. In the form of Mitra, he is in the moon and in the oceans. So, the Adityas are regarded as the beneficent gods and act as protectors of all beings. As they are twelve in number, they are also referred to as Dvadashadityas. In fact, the 12 Adityas represent the twelve months in the calendar as well as the twelve aspects of the Sun. It is believed that the Adityas take away all the sinful reactions of those who remember them each day at dawn and sunset. Prajapati is regarded as the supreme creator in the Vedic era of Hinduism. He was responsible for the creation and preservation of life. In the beginning, the term Prajapati was used about many figures. However, later on, the term was used to denote a single deity. Prajapati is the lord of all creatures and is often identified with Sun God, Vishnu, and Shiva. In fact, the term Prajapati consists of two words – “Praja” meaning offspring and “pati” meaning lord or master. The Vedas and Upanishads have described Prajapati as the creator of all living beings. Moreover, the Rig Veda describes Prajapati as the first god and the creator of all other gods and beings. Prajapati was often identified with Lord Brahma. In fact, it is believed that Prajapati was Brahma. The Vedas narrate the story of the creation of Prajapati. It is believed that Prajapati was created in the form of a golden egg. Once hatched, he used his three breaths and created the god of lightning (Indra), the god of fire (Agni), and the sacred plant, soma. He also created planets, seasons, earth, air and the sky. Prajapati had a daughter named Usha, the Goddess of the dawn. Through her, Prajapati evolved to be the father of all living beings. Indra who is also known as Devendra is regarded as a Vedic deity in Hinduism. According to Hindu mythology, Indra is the king of the heavens (Svarga) and the Devas. Lord Indra is God of the heavens, lightning, storms, rains, and river flows. In fact, Indra is the most talked about deity in the Rig Veda. Indra is known for his extraordinary powers. He is the destroyer of Asura Vritra who was responsible for human pain and sufferings. Indra is regarded as the friend of mankind, the one who brings rains and sunshine. Indra is depicted as wielding a lightning thunderbolt which was named as Vajra. He rides on a white elephant known as Airavata. Indra’s heavenly home is on Mount Meru (also known as Sumeru). However, Indra’s importance diminished in the post-Vedic era where he is shown as a powerful hero but the one who also gets into trouble due to his adulterous and hedonistic ways. That said, the concept of Gods in Hinduism has evolved down the ages beginning from the Vedic Era through the medieval period and across Hinduism’s diverse traditions. However, the idea of equivalence has been cherished in all the periods, declaring they are the same. There are many ancient as well as medieval era texts of Hinduism which have popularized the concept of deities. So, Hindus began to worship Vishnu, Sri Lakshmi, Shiva, Parvati, Durga, Brahma, Saraswati, Ganesh, and various incarnations of Vishnu such as Krishna and Rama. Hindus believe that their Gods and Goddesses have specialized knowledge, creative energy, and exalted magical powers. Lastly, we want to emphasize that amidst all diverse opinions and beliefs, Hinduism has continued to maintain that there is one Supreme Power that exists among all the Gods and Goddesses.